Schiffbau is the younger, infinitely cooler sister of Schauspielhaus, one of Zurich’s main theatres. For a start, the building looks amazing; the former industrial warehouse is well maintained and has been subtly enhanced with modern features. 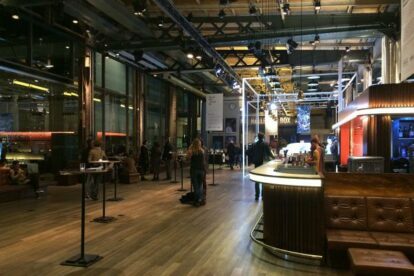 The plays shown at Schiffbau tend to be less well-known than at Schauspielhaus, and it is also where productions by Junges Schauspielhaus, the young ensemble, and a monthly poetry slam session are staged. You can buy tickets online and print them out yourself. Every Monday is ‘Theatre Monday’ which means tickets are half-price for all categories – so grab yourself a bargain seat. Schiffbau offers more than drama in a stunning location: on site there’s also La Salle, a somewhat poncey restaurant with a more down-to-earth bar next door as well as Moods, a jazz club putting on gigs from across the spectrum of jazz, blues, world music and hip hop. Also part of the Schiffbau building is Nietturm, a bar in a glass-fronted tower overlooking the surrounding area. Whether you’re into theatre or not, Schiffbau has got something to offer. In fact, the building is worth a visit in its own right.